If we want to avoid “build-out” in the near future in Forsyth County, a change will need to be made in the way we develop the remainder of our available land. The 2001 Legacy Plan has had successes and failures in its attempt to curb sprawl and guide compact development. 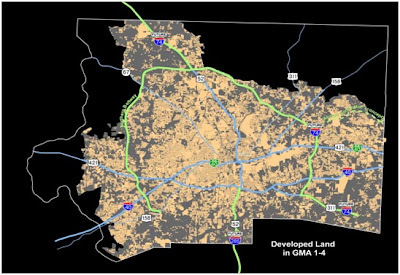 While demographics show that we are not increasing our overall density in Forsyth County, our existing land use map does show increased densities along some strategic corridors. Unfortunately, the sites currently recommended for increased residential growth may not be enough to truly impact our density levels in the future. We do have new tools in place through regulatory changes which should help provide incentives for infill and increased densities, but additional strategies and tools will need to be developed. Negative perceptions of increased densities will need to be addressed through better design requirements. For nonresidential land use, Legacy principles and Area Plan recommendations have done a good job. While progress has been made through the formation of Activity Centers, further steps must be taken to focus commercial development and continue to promote compact, walkable development. More incentives need to be created to encourage mixed-use development and strategies need to be developed to protect viable industrial and business park sites. After community discussion, general land use principles and recommendations will be developed for this chapter. The more detailed strategies for land use objectives will be addressed in the Land Use Regulation and Area Plan chapters of this Plan. The biggest concern for the county is where to put our solid waste. Hanes Mill Landfill has less than 30 years of operation and Forsyth already ships out a lot of waste, which is expensive. If we do not find another site for a potential landfill, expenses will sharply increase with the current population, not to mention the increase in population being predicted (120,000). To lengthen the life of Hanes Mill, the county should invest time and all possible efforts towards waste diversion (i.e. a large scale composting facility which would divert waste, give WS and other participating cities in the county a greener touch, hopefully promote gardening, and provide quality local medium for those gardens). Another developing technology in land diversion is a waste-to-energy idea where consuming waste through a plasma arc and/or gasification harnesses the energy thereof, and with a consistent and large enough flow of waste, ideally would power itself as well as other utilities (basically replacing the resource of coal from Appalachian mountains currently being destroyed with waste that would otherwise be going to a landfill). A type of waste diversion that is still developing here in Forsyth (but is much more developed elsewhere even within this state) is recycling. Having a much more sophisticated recycling program would also reduce the amount of waste going to the landfill. These ideas would lengthen the life of our last major operating Landfill, while turning waste into a resource. Another use of land is food production. Instead of shipping in products from around the world, why not cut costs and grow what our climate allows us to whether it be traditional land farming or structural farming (i.e. vertical farming, green roofs, etc. which would reduce the temperature of the city areas with little to no greenery (mostly pavement/concrete) if enough structures participate)? We have pretty good soils here, and plenty of tall structures in the city areas that could be outfitted to grow food. An additional 120,000 people will need places of residence. Although there are energy intensive suburbs still being built on the outskirts of existing cities, we should look to renovating the many existing structures that are abandoned to be low impact buildings of residence and preserve as much undeveloped land as possible (for the next 100,000 people to follow generations down the road). Because WS downtown is as attractive as it is, another possible solution to where to put people is having more condo/apts downtown similar to the ones recently constructed where parking is included in the structure. Iiagree with Stoltz. It is time to cease destroying our forests and farmland for houses. We need the forests, as does the wildlife.